This is not a comprehensive ISPConfig guide – I’ll only show you the first steps after the installation and give you some useful tips. I proceed on the assumption that ISPConfig is already installed. The installation instruction can be found here: http://www.ispconfig.org/manual_installation.htm. 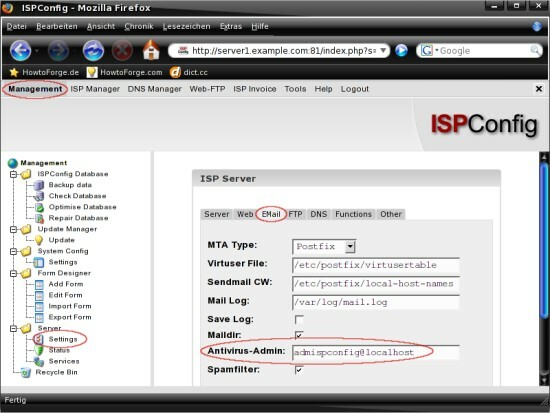 Guides for preparing your server for ISPConfig can be found on http://www.ispconfig.org/documentation.htm. 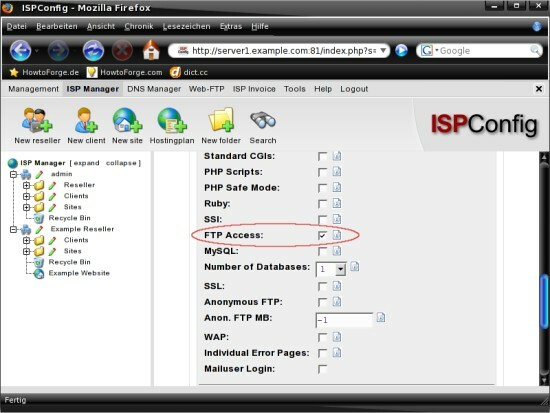 Open the ISPConfig webinterface (http://%fqdn_or_IP%:81 respectively https://%fqdn_ or_IP%:81) within your preferred web browser and log in with the username “admin” and the password “admin”. First you should change the admin password. Click on “Tools” in the top menu and choose “Change Password” from the “Tools & Options” menu on the left side. Enter your old password and the new one into the corresponding fields in the main window and click on “Save”. 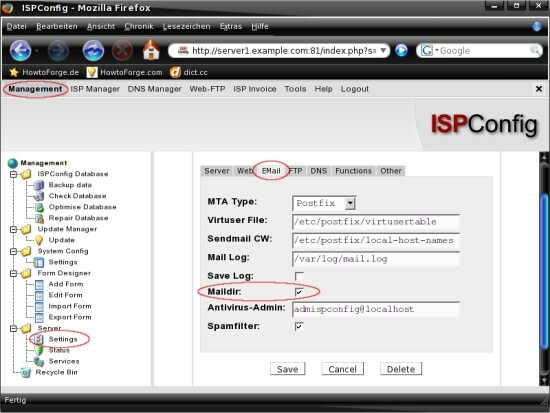 In order that the emails will be stored in the maildir format instead of the mbox format, we have to adjust the ISPConfig email settings. Click on “Management” in the top menu and choose “Server” -> “Settings” from the “Management” menu. Switch to the “EMail”-tab in the main window and mark the checkbox next to “Maildir:”. Afterwards click on “Save” to apply the settings. It would be a good idea to use an existing email address as admin email 🙂 Click on “Management” in the top menu and choose “Server” -> “Settings” from the “Management” menu. Switch to the “Server” tab in the main window and insert an existing email address. Afterwards click on “Save” to apply the settings. Do the same again on the “EMail” tab and on the “DNS” tab. There are a few tools and add-ons available for ISPConfig. The installation is very simple – click on “Management” in the top menu and choose “Update Manager” -> “Update” from the “Management” menu on the left side. Mark the radio button “URL” and insert the URL (e.g. 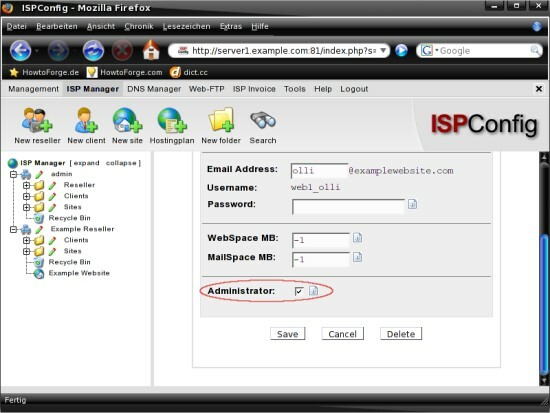 http://ispconfig.org/downloads/webmail.pkg for the Uebimiau webmail package) of the tool/add-on that you want to install into the corresponding field in the main window and click on “Install”. The packages for the tools and add-ons will be updated regularly – so please have a look at http://www.ispconfig.org/downloads.htm to find out if you have the latest version installed. After the installation you’ll find a link to the tool/add-on in the “Tools & Options” menu when you click on “Tools” in the top menu. 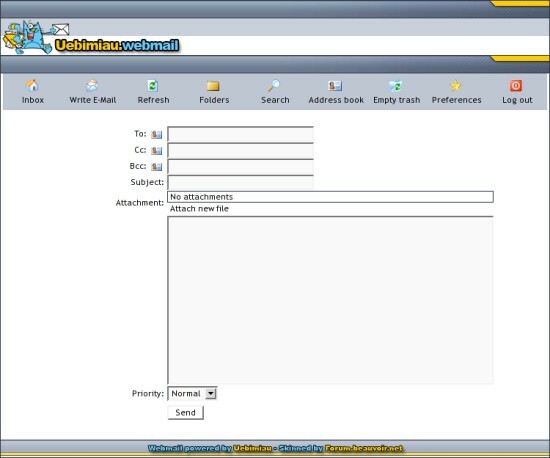 Uebimiau is a popular webmail client which supports POP3 and IMAP. 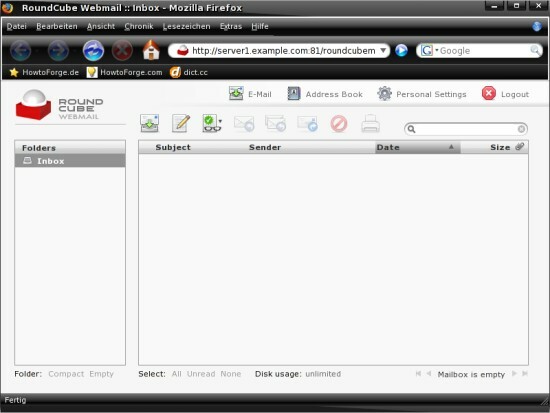 Taken from the Roundcube page: “RoundCube Webmail is a browser-based multilingual IMAP client with an application-like user interface. 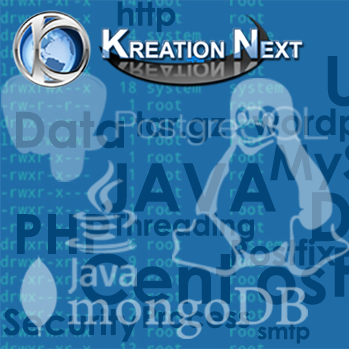 It provides full functionality you expect from an e-mail client, including MIME support, address book, folder manipulation, message searching and spell checking. 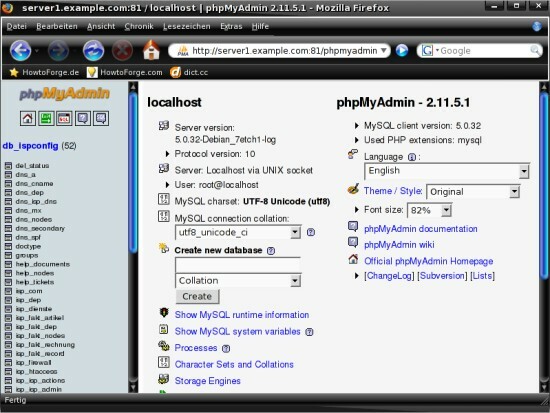 RoundCube Webmail is written in PHP and requires a MySQL or Postgres database. The user interface is fully skinnable using XHTML and CSS 2”. If you want to add a new reseller click on “ISP Manager” in the top menu and afterwards on “New reseller” (the big icon below the top menu). Now you have to fill the form within the main window. The group for resellers is fixed to “admin”, so you can’t change it. 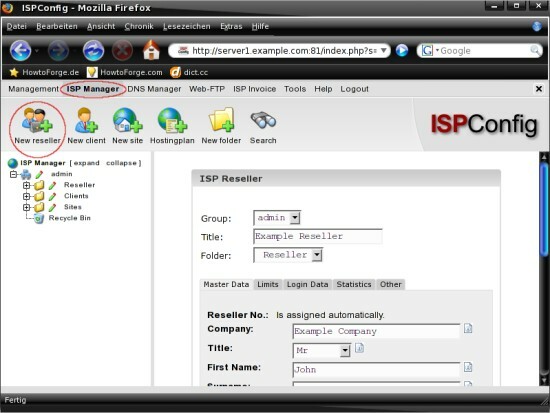 Enter a title for the new reseller – this title will be shown in the “ISP Manager” menu on the left side. Choose a folder – this option defines to which folder (in the “ISP Manager” menu on the left side) the reseller will be added – please note that also a “main folder” will be created for this reseller. Now you have to configure a few settings for the new reseller – they are divided in five tabs. The “Master Data” tab contains the personal information of the reseller like the address or the telephone number. The “First Name” and the “Surname” is required – all other fields are optional. The “Limits” tab contains the limitation settings for the reseller. 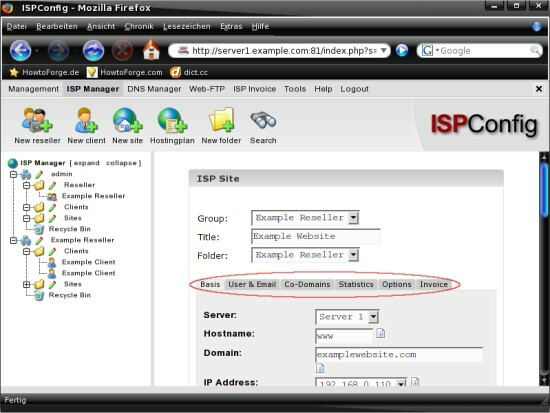 You can adjust things like traffic limit or the maximum number of allowed sites. Please note, that “-1” means unlimited. 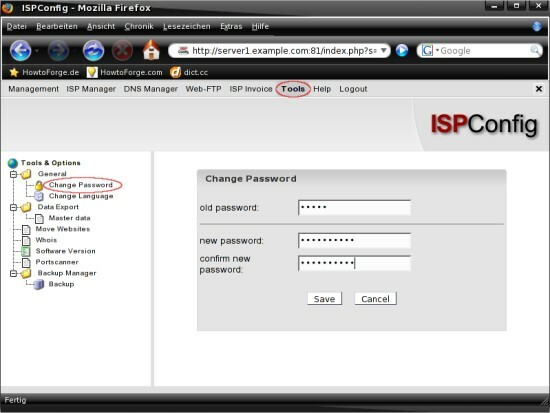 The “Login Data” tab contains a form with two fields where you have to set a username and a password for the reseller. Please have a look at step 2.4.4 if you want to set passwords longer than eight charakters. The “Statistics” tab contains, as its name implies, statistics for this reseller account. At the moment it’s empty – later, when this account is in use, it’ll contain information. The “Other” tab contains a few forms for standard messages – for example the properties of the salutatory email for clients or the properties of the web site suspend notification if the trafic limit is exceeded. You can work with different variables – they are explained in the single forms. When all settings are complete click on “Save” to apply them. If you want to add a new client click on “ISP Manager” in the top menu and afterwards on “New client” (the big icon below the top menu). Now you have to fill the form within the main window. First you have to choose a group for the new client – you can add him to an existing reseller or to the group “admin” if he doesn’t belong to a reseller. 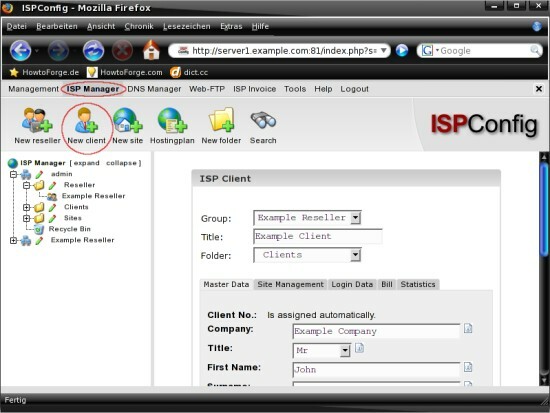 Enter a title for the new client – this title will be shown in the “ISP Manager” menu on the left side. 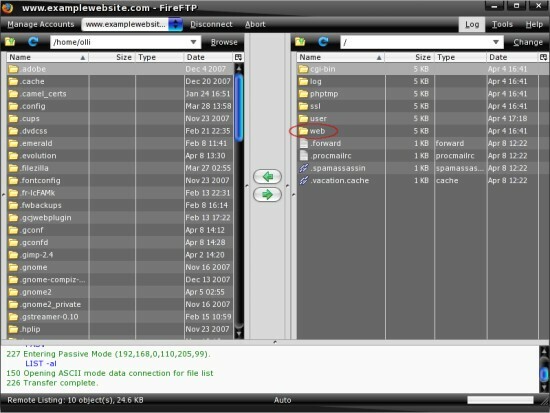 Choose a folder – this option defines to which folder (in the “ISP Manager” menu on the left side) the client will be added – please note, that if you chose a reseller as group, the client will be added within the main folder of this reseller – otherwise the client will belong to the admin (which is fine if you don’t need resellers). Now you have to configure a few settings for the new client – they are divided in five tabs. The “Master Data” tab contains the personal information of the client like the address or the telephone number. The “First Name” and the “Surname” is required – all other fields are optional. On the “Site Management” tab you can create a new site for the client – I’ll explain this detailed in step 2.7. The “Login Data” tab contains a form with two fields where you have to set a username and a password for the client. Please have a look at step 2.4.4 if you want to set passwords longer than eight charakters. The “Bill” tab contains the settings for the payment. You can enter a billing address and choose a payment option – “netto seven days” for example. The “Statistics” tab contains statistics for this client account. At the moment it’s empty – later, when this account is in use, it’ll contain information. 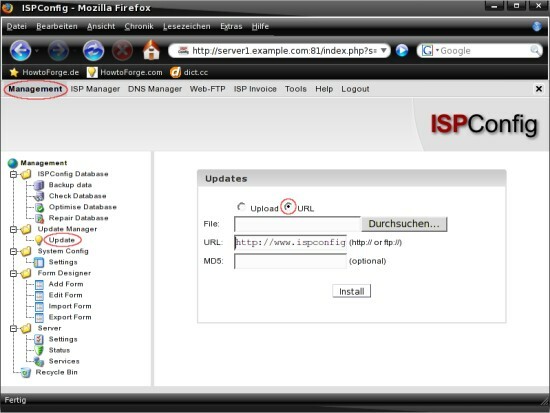 If you want to add a new website click on “ISP Manager” in the top menu and afterwards on “New Site” (the big icon below the top menu) – please note that the following steps are the same as at step 2.6.2. In the main window choose a reseller or admin, a customer (client) and a hostingplan. Click on “next” to proceed. Next choose a group, a title (that will be shown in the “ISP Manager” menu on the left side) and a folder (this defines to which folder the website will be added) – please note, that if you choose a reseller, the website will be added within the main folder of this reseller. Now you have to configure a few settings for the new client – they are divided in six tabs. The “Basis” tab contains the main settings for the new site – for example the hostname, domain or optional Apache directives. 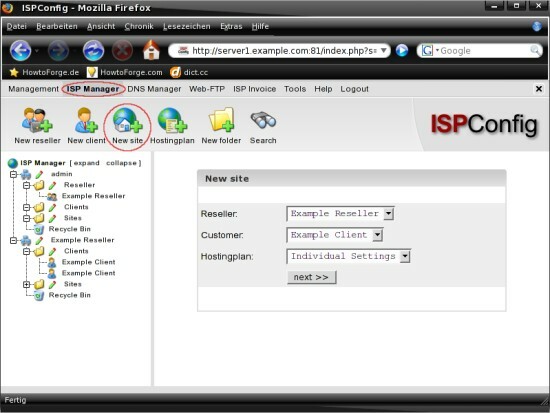 On the “User & Email” tab you can create new FTP-users/email addresses – click on “New” if you want to create a new ISP user (which means a FTP-account and an email address). 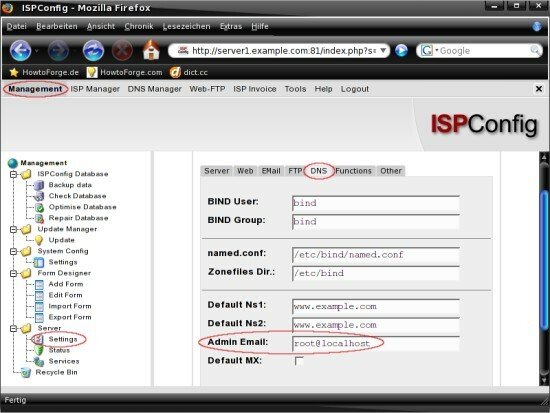 The first tab (“User & Email”) contains the main settings for the new ISP user, for example the email address and the password (for email and FTP). The checkbox next to “Administrator” is very important – this ISP user will be able to access the website content (the document root) via FTP if you mark it – non-admin users will only be able to access their home directories, but not the document root. The second tab (“Advanced Settings”) contains settings related to the email address, for example to which email adresses incoming mails shall be forwarded etc. The last tab (“Spamfilter & Antivirus”) contains corresponding settings, for example entries for the black- and whitelist or the spam strategy. On the “Co-Domains” tab you can create new co-domains (subdomains) for the client’s domain. Click on “New” if you want to add a new co-domain. The first tab (“Domain”) contains the main settings for the new co-domain – enter a hostname and the parent-domain. You should also mark the checkboxes below to create the needed DNS records. The second tab (“Forward”) contains a single field where you can enter a location, to which this co-domain will be forwarded. On the last tab (“Options”) you can choose if you want to use the local mailserver or an external one for this Co-Domain (if you have set up some other mail server to handle emails for the Co-Domain, select “External Mailserver”, otherwise “Local Mailserver”). Click on “Save” to apply the settings. The “Statistics” tab contains statistics for this website. At the moment it’s almost empty – later, when this website is in use, it’ll contain more information like traffic statistics, etc.. The “Options” tab contains a few settings related to the mailserver and the webserver. For example you can define the maximum logsize (relative to the quota in percent or megabytes) or set the DirectoryIndex. The last tab (“Invoice”) contains the settings for invoices – web, traffic and the domain are separated from each other. You can add additional items if you want. First we have to enable FTP access for the website – have a look at the screenshot below (Basis settings, see also step 2.7.1). Next we need an ISP user with admin privileges – have a look at the screenshot below (User & Email settings, see also step 2.7.2). 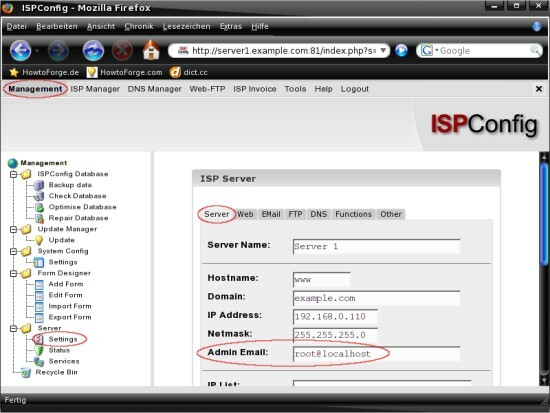 Now you can access the FTP server with the ISP user account. Please note that the contents of your website are located in the folder “web”. You can edit the DNS settings with the “DNS Manager” which is available in the top menu. 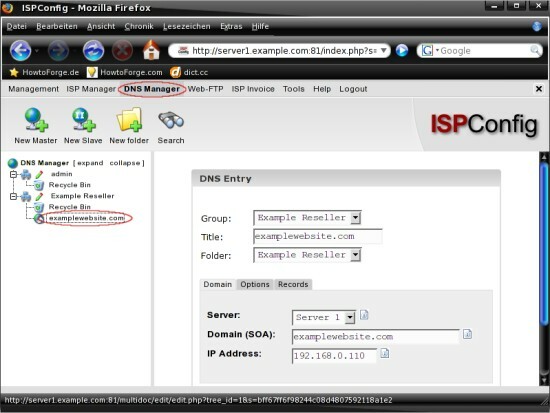 Select a website from the “DNS Manager” menu on the left site – afterwards you can adjust the DNS settings in the main window, which are divided in three tabs. The “Domain” tab contains the the domain settings for the website. 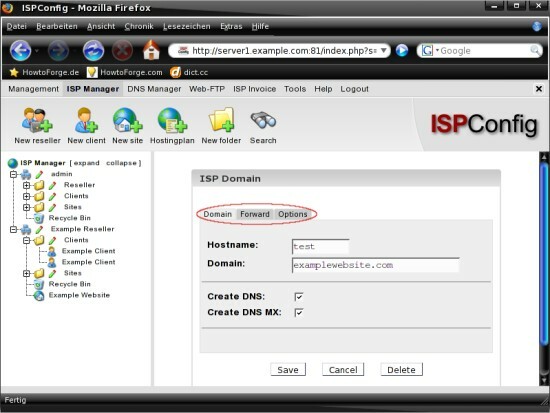 You can adjust the server, domain and IP address. If the domain should be available to the public, you must enter a public IP address here, not a private one. The “Options” tab contains settings that are related to the name servers, for example the refresh time or the retry time. The “Records” tab contains the settings for DNS records. You can create/edit A-records, MX records, CNAME records, and SPF records. Statistics will be created in the night (by default at 4:00am). 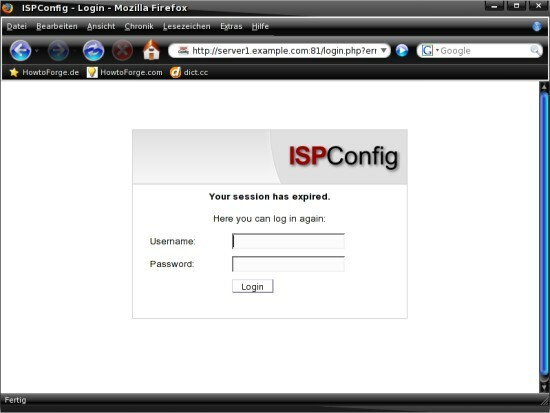 Please note that new or changed passwords in ISPConfig will affect the statistics not until 4:00am. Example: If you changed your password you’ll have to use your old password to have a look at the statistics till 4:00am – only then the new password is available for statistics. You got the error-message “Mail loops back to myself“? You forgot to add your domain to “/etc/postfix/local-host-names“. Afterwards you have to restart postfix (/etc/init.d/postfix restart). You got the error-message “This IP is shared“? You’ve set the wrong IP for this virtual host on the Basis tab of the web site. This happens if you use your router’s IP and not the one from your system – execute the command “ifconfig” to find out your system’s IP. If you delete an item (web site, user, DNS record, etc. ), it is not removed immediately, but moved to the recycle bin from which you can either restore the item or delete it. You should keep this in mind if you try to recreate an item that you’ve previously deleted and get the error message in ISPConfig that this item is already existing in the system – you’ve probably forgotten to remove it from the recycle bin.